The Nestle Peptamen AF Complete Elemental Unflavored 250ml Case of 24, Model #9871666370, is anchored in advanced science and research. Nestle Healthcare Nutrition offers nutritional solutions for people with specific dietary needs related to illness, disease states or the special challenges of different life stages. 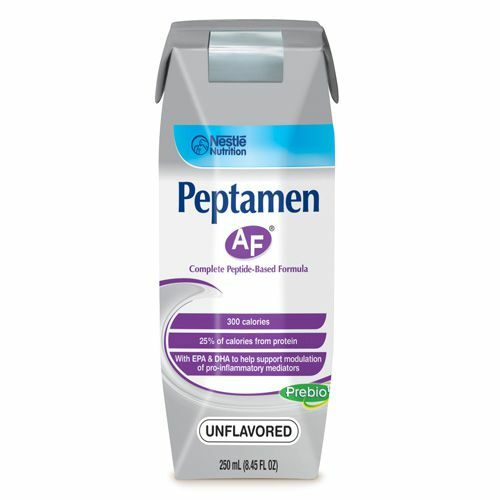 The Nestle Peptamen AF Complete Elemental Unflavored 250 ml Case of 24 is an advanced formula for those with impaired GI function who are facing metabolic-stress medical conditions such as sepsis, critical illness with GI Dysfunction, etc. This peptide-based formula is well-tolerated and contains added fish oil. Intended for tube feeding only. For use under medical supervision. Contains a lipid profile (omega-3 fatty acids) and antioxidants (vitamins C & E and selenium) supported by the Critical Care Nutrition Guidelines. Very high protein to support the demands of metabolic stress. Balanced peptide profile and MCT oil to promote absorption and tolerance. Prebio1 soluble fiber blend helps promote growth of beneficial bacteria to help support digestive health. Critical illness with GI Dysfunction. Ingredients: Water, Maltodextrin, Enzymatically Hydrolyzed Whey Protein (from Milk), Medium Chain Triglycerides (from Coconut and/or Palm Kernel Oil), and less than 2% of Cornstarch, Refined Fish Oil (Anchovy, Sardine), Soybean Oil, Fructooligosaccharides (Soluble Fiber), Soy Lecithin, Inulin (Soluble Fiber From Chicory), Magnesium Chloride, Sodium Ascorbate, Guar Gum, Calcium Phosphate, Salt, Choline Chloride, Calcium Citrate, Sodium Phosphate, Alpha-Tocopheryl Acetate, Taurine, L-Carnitine, Magnesium Oxide, Zinc Sulfate, Potassium Chloride, Niacinamide, Ferrous Sulfate, Calcium Pantothenate, Manganese Sulfate, Vitamin A Palmitate, Pyridoxine Hydrochloride, Vitamin D3, Copper Sulfate, Thiamine Mononitrate, Beta Carotene, Riboflavin, Folic Acid, Citric Acid, Biotin, Chromium Chloride, Sodium Selenate, Potassium Iodide, Sodium Molybdate, Phytonadione, Vitamin B12.